Home » BJJ Belts & Promotion » What are the BJJ belt ranks for children? What are the BJJ belt ranks for children? This is easier to understand as only five base colors–white, grey, yellow, orange, and green–with each having two variations (white or black). 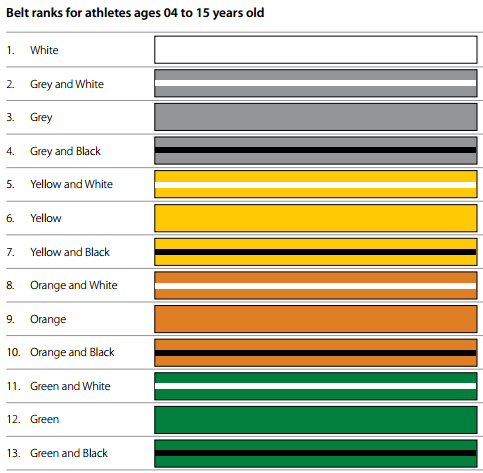 Many schools use only the five main colors, and some don’t use the grey belt or white/black “in between” ranks, which are newer additions. Kids also get stripes on their belts to mark degrees. These go on solid black bar at one end of the belt. The usual system is to give four white stripes before promoting to the next belt color. These are normally awarded based on time and attendance. The IBJJF has a variations of the stripe system for schools that do stripe promotions every month, every three months, or every forth months. The monthly system adds red and yellow stripes, bringing the total number of stripes to 11. The IBJJF decided to add more ranks for kids to solve the problem of kids not having a smooth progression up through ranks, which often left kids stuck at the same belt for years. While you’d hope kids would train because they love it and not because they want a new belt, kids do get very excited by promotions. Adding more belts gives instructor more ways to track and reward progress. It also allows tournaments to more fairly group the different ages and skill levels of young athletes. When a kid turns 16, the instructor promotes them to an adult rank. 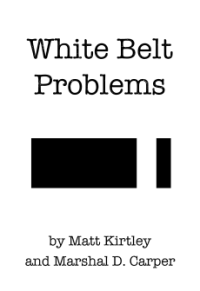 White belts remain white belts, but colored belts usually become blue belts. An instructor can choose to promote a green belt straight to purple belt if they are ready.